Any strain can stretch or tear the supporting ligaments in the ankle. The resulting ankle sprain or sprained ankle quickly becomes painful and swollen. While initial focus is on reducing that pain and swelling, physiotherapy is necessary to fully rehabilitate this extremely flexible, load-bearing joint. All physiotherapy, however, is not the same. Proprioception. The first key issue for ankle sprain rehabilitation is proprioception. For smooth, accurate movement, the brain must be able to understand what its body parts—particularly extremities—are doing. For ankle proprioception, the mind must be able to gauge an ankle’s functionality without resorting to actually having to watch the joint. Strength. A second focus of ankle sprain rehabilitation is stabilizing the ankle joint by strengthening associated muscles. The goal is to not only recover joint use but also strengthen the area sufficiently to prevent a future ankle sprain. To both rehabilitate and prevent further ankle sprains, researchers and scientists at CEVRES Santé created the Myolux concept. It is a specialized approach to physiotherapy that blends strength with agility for improved neuromuscular control in a dynamic context. Focus is on the subtalar joint, the bones in the heel of the foot that connect to the ankle. The ligaments and muscles stabilizing the ankle surround this joint and are key to both its strength and stability. The tool used to exercise this specific area is a pair of articulators. 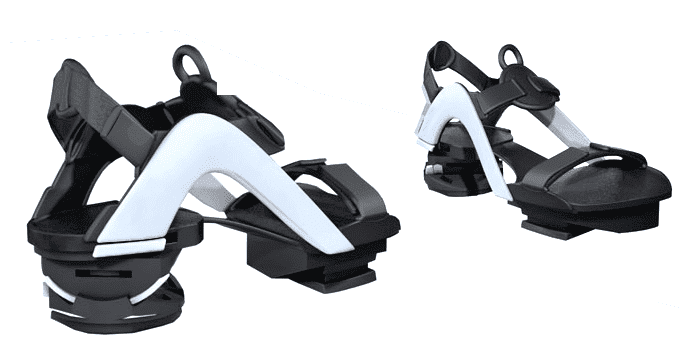 These articulators are specifically designed to destabilize the rear of the foot while allowing the ankle joint to safely perform therapeutic exercises vital to a range of agile locomotion: from walking to running or changing direction, for example. Through repeated exercise, the brain learns to rapidly identify potentially injurious or risky movements that occur in demanding situations. At the same time, secure yet challenging exercises with the articulators strengthen the muscles essential to stabilizing the ankle on all axes. Exercises focus specifically on the strength and agility of fibular muscles. Exercises are active and in the standing position. Therapies correlate to the specific athletic situations likely to result in trauma. Exercises incorporate resistance levels that are consistent with high-risk scenarios. The goal is for fibular muscles to be able to compensate for forces encountered at or exceeding full body weight. Exercises are geared for versatility in rapid muscular response. Therapies address both eccentric and concentric modes of muscle contraction—muscle lengthening versus shortening while contracted. Together, targeted proprioception and increased muscle strength can enhance the communication and coordination between mind and body.